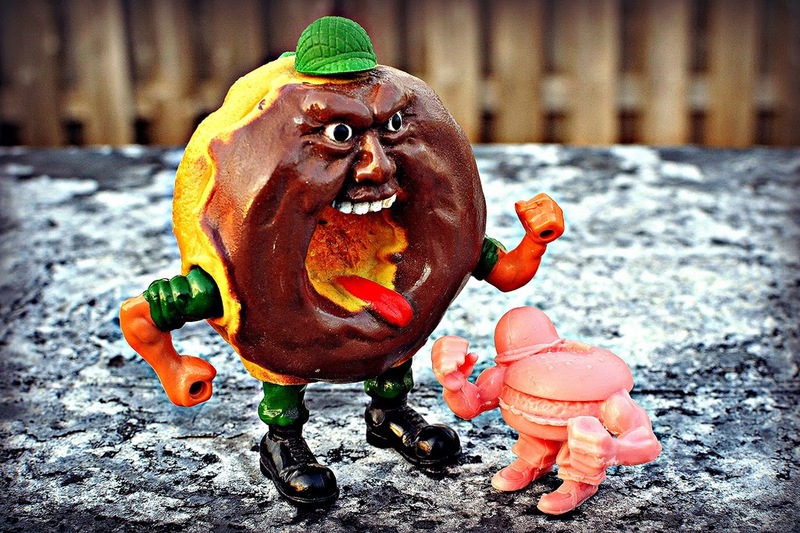 WHAT: My fellow weirdo toy collectors, remember the totally rad old action figure line from Mattel called Food Fighters? You know, the figures that were crazy-looking anthropomorphic pieces of grub dressed in fatigues and ready to do battle in your kitchen? I recall them being a fixture of toy aisles in the late '80s, and owned the donut guy, pancake guy and drumstick guy. 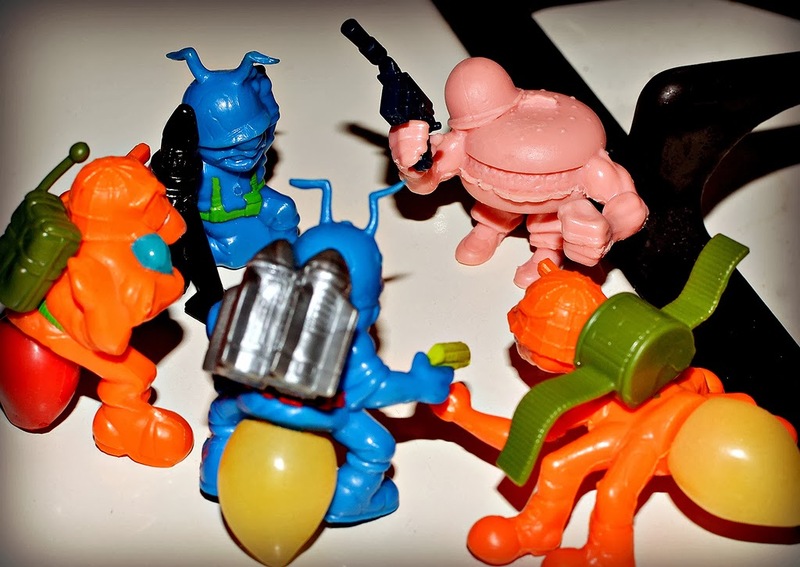 Wouldn't it be great if there was a mini figure take on Food Fighters? Eric Villanueva of 1Shot Toys apparently thought so, and did something about it. Eric thought up a new line of mini food battlers called "Snack Attack," and created "Sgt. 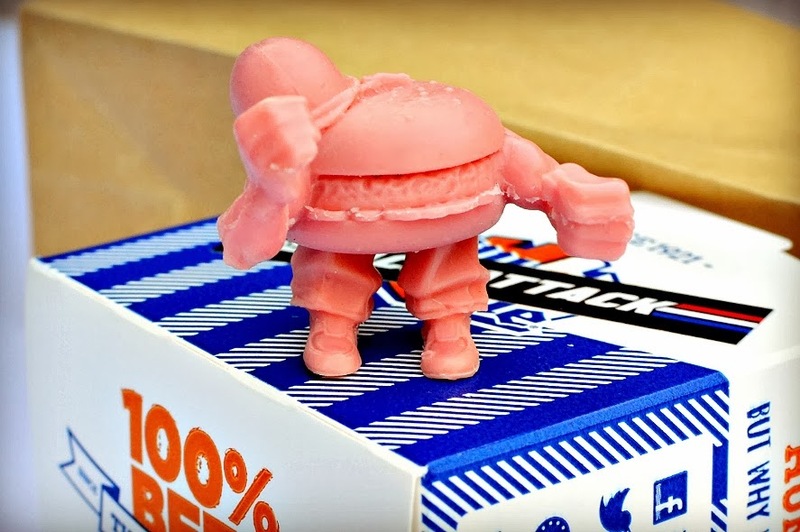 Angus," a very awesome battle-ready hamburger dude, as its first release. If you follow indie mini figures or indie toys in general, you might already be familiar with this beefy sergeant. He was first revealed this Spring, and has been on sale at various times since then. Some colors released so far include neon orange, neon green, red/yellow swirl and classic MUSCLE pink/flesh as shown in this post. Cast by Tru:Tek, Sgt. Angus has been produced in a soft, keshi-style rubber that you'll likely be familiar with if you've collected other indie mini figures. This figure boasts an incredibly fun sculpt. Detailed, yet not overdone. 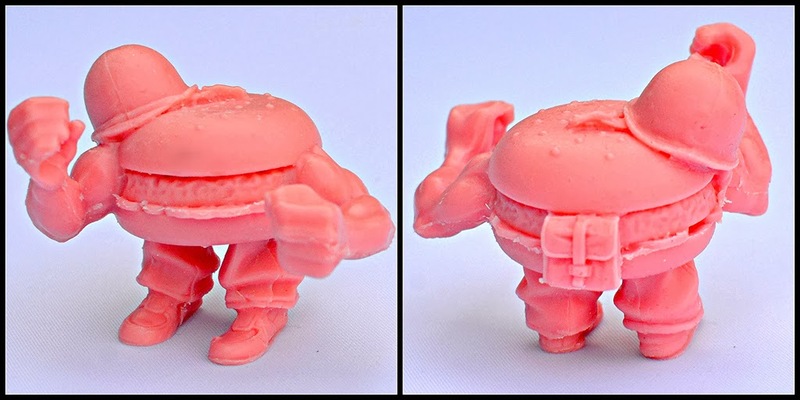 It's a clean sculpt that really allows you to appreciate all the little elements that make it so cool, such as the Sarge's askew helmet, the lettuce sticking out from under his beef patty, the tiny sesame seeds on top of his bun, and the creases in his pants. I also really like his muscular arms that are bent and stick out quite a bit forward, giving the sculpt more dimension than a typical mini figure. Plus, his right hand is capable of holding a weapon, which is a nice feature that's also not common for this type of toy. Sgt. Angus encounters Major Munch of the Food Fighters! The clever packaging is also worth noting. Sgt. Angus comes in a hamburger box from the fast food chain White Castle that has a Snack Attack sticker of the line's logo applied to the front of it. Also included is a cut-out character bio/background reminiscent of one from G.I. Joe figure packaging. All of it was packed in a little brown take-out bag. Very fun! Sgt. Angus is a fantastic addition to the ever-growing legion of indie mini figures that have been coming at us from many talented toy-makers. I can't wait to see what other characters will join him (according to this man-e-toys post, it looks like an ice cream character is in the works). Hopefully soon we'll be able to stage a full-out rubbery Snack Attack war in the kitchen! WHEN: Sgt. Angus first revealed his char-grilled self in Spring/Summer 2013. WHERE: The figure has been sold in various colors online as well as at a convention or two. Although sold out at the time of writing this, keep an eye on the 1Shot Toys store if you're interested in getting your hands on one (I'm not sure of any specific release plans, but the figure has been sold periodically since it first came out). WHO: Created/sculpted by Eric Villanueva of 1Shot Toys and cast by Tru:Tek.